Savoury muffins are delicious and make excellent picnic food. 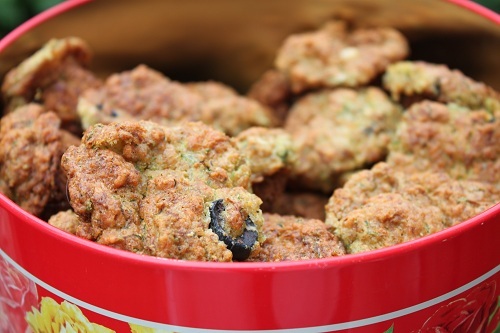 Having learned a lot since I took a baby Milla on her first picnic (ok, I learned one thing: fishcakes do not make good picnic food for babies) I have developed a heap of picnic favourites. You can make these as regular sized muffins but I think they are best as mini muffins. Stir through the courgette, cheese and olives. Whisk the milk, egg and oil in a separate jug then fold into the dry mixture until no flour remains then stop to ensure it isn’t over-mixed. Bake for 30 minutes (regular muffins) or 15 – 20 minutes (mini muffins). Do you think pumpkin would work instead of courgette – it’s soon to be carving season you know. They seem to have worked ok with the pumpkin. I have no idea what variety it was though I should because it came from our allotment. They actually remind me of eating cheese scones though I suppose the texture is not the same. I will put a few pictures on the facebook page.